Hundreds of thousands of Sidama women marched on the streets of Awassa to protest the delay of the referendum for the statehood of Sidama ethnic group. Women hold fresh leaves during the protest as in the tradition of the Sidama. The intention of the women-only protest march is to demonstrate that Sidama women support the quest for statehood, according to a report by state media. Abiy Ahmed led Federal government has pledged, in 2018, demand for ethnic Sidama statehood would be entertained in accordance with the constitution. A number of other ethnic groups within what is now “Southern Nations, Nationalities, and Peoples’ Region” which is the most multi-ethnic regional states of all the nine ethnic-based Federal regions in the country have demanded statehood status after the Sidama question was accepted by prime minister Abiy Ahmed. Sidama Women protest march against the delay of the referendum came amid pressure from activists and politicians on the Federal government to reconsider the ethnic-based Federal state arrangement on grounds of pervasive violence and claims of exclusive land right which has affected the rights of citizens. 3 Responses to "Sidama women marched Awassa demanding ethnic-Sidama statehood"
This year Kenya’s economy along with the whole region are going to be affected due to dry weather drought expected . Ethiopia’s food security reserve has depleted extremely low currently there is a tender out by the government to buy grains from the international market .Ethiopia borrows money from China and the west with interest just to buy grain and feed itself. If that is not failed state I do not know what is. The way it’s going, every ethnic group will eventually ask for statehood. Again, a result of the so called federalism under the disguise of ethnic friction. 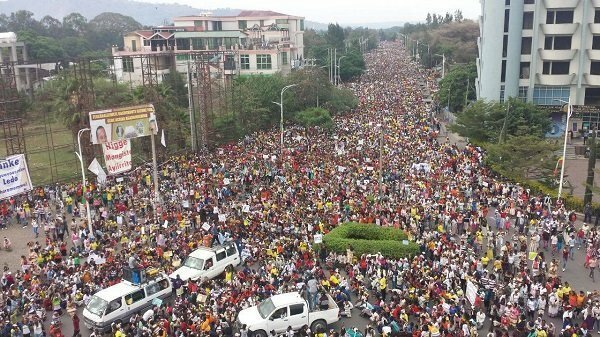 “Hundreds of thousands of Sidama women marched …. women-only protest march …..” !?!?!? I can’t believe what I am reading and seeing a photo of “women-only”. I DON’T OPPOSE, needless to say. I AM DELIGHTED, ECSTATIC that Ethiopia has reached that stage for me to see such development in my LIFE TIME, in Africa???? No, no, no, no ……… there is something wrong, HELP, PLEASE!! !